I was teaching English to a few 13 year old’s the other day. It was the last class of the day, around 6pm and these kids have probably been learning since 8 or 9am. Motivation was running a little low, to say the least. I was trying to communicate to them why it was so important for them to focus and learn English. I took the angle of drawing out a pie chart. Showing more than half the world speaking English – the language they were learning, and a small chunk speaking Korean – their native tongue. I explained, if they wanted to travel or work internationally or even in higher positions in Korea, they’d need to understand some English. Teaching English as a second language.. If you are a native English speaker, you’ve already won a lottery you may not know of. The opportunity to travel around the world and teach English abroad. It pays great, and it’s an extraordinary experience. For better or worse, you don’t need teaching experience. All you need is most cases is a university degree and a clean criminal record. You can see new parts of the world, experience living in these places long term and easily save upwards of $20,000 a year if not more. Heck, there’s even options of teaching online these days where you can work from anywhere in the world on your own time, making $21/hour to start. I was recently speaking with some writers of another financial independence website, Primal Prosperity, and we got to discussing TESL. They mentioned a few attractions to the opportunity beyond just financial gain. What interests them is bang on, to what the experience is really about. In this post I am going to speak to some of the attractions they had to ESL. Most contracts you’ll sign are for a year when teaching English abroad. That gives you a completely different experience than just visiting somewhere as a traveler or tourist for a few weeks, or even a few months. You will be working with locals, you will be frequenting establishments in your town, city and country of choice. You may even become a regular at various places. You’ll get to experience a different culture first hand. It’s one thing to see the way another society or culture does things. It’s another to understand WHY they do things a certain way. Since being in Korea it’s so interesting to begin to understand how their customs and ideas differ from those in Canada. It’s also so cool to see how alike we are. I remember going to a Korean wedding recently, at one point there was a powerpoint slide showing old family photos. I looked at the bride’s mother getting teary to the photos and it reminded me so much of my own mother. Lots of people treat TESL as a working vacation. Despite the lack of responsibility, you are still here to do work. And it’s important work, teaching children a new language that will benefit their futures. I’ve personally heard the job is a glorified daycare, some days that doesn’t seem far off. But regardless, you have the opportunity to make some real impact on many people’s lives. Both parents who invest in their children’s future by working hard to pay for English academies, and children who will grow up bilingual. And as you build relationships with your students, and coworkers, you’ll begin to feel its almost a type of spiritual therapy to yourself. It’s so rewarding to see students progress. Don’t get me wrong, some days I feel like smacking some students across the room, and pulling my hair out. But others, I feel some serious love for these tiny humans. I’ve had people refer to this work as ‘escaping the 9 to 5’. Well I don’t totally agree with that as I am still required to be at my school for 40 hours a week, it is definitely not an office job. Yes there is some planning required at some jobs, more or less teaching depending on the institute you work at. I know teachers teaching 40 hours a week, I currently teach 19 hours a week. Even in class, you can make the lessons as fun as you want. Implement games, move around, interact with the kids. It’s not paper pushing. The funner you make the classes, the faster they fly by. And even after a long day of teaching English, you walk out the school doors into a foreign land every day. Right now, I could take a weekend trip to China or Japan for $200 round trip or less. How many office workers can say they can do that? Now, I have mostly been speaking about teaching English in class while abroad. But there are now options where you can get a taste of teaching ESL from online, anywhere in the world, anytime you want. I will leave only a few details for the time being. You can contact me at info@thatcharleslife.com if you are interested in learning more about this opportunity. Since you are already on a different side of the world, all those cool places that might cost thousands of dollars to get to from North America, now cost a few hundred. Plus, usually your flights out to the country you teach in and when/if you decide to return home.. Are paid for! Being in a country for a year, you have plenty of time and weekends to explore different parts of the country. Even in a country the size of Korea, there are so many things to see and do beyond just the few big, famous cities. Save a boatload of money..
Primal Prosperity is a finance blog, and so is That Charles Life. So we’ve gotta’ talk dollars. Not only do you have the chance to see the world, make an impact, and do something extraordinary. You have the opportunity to make bank while teaching English. Teaching English abroad is one of the best scenario’s for the argument that it’s not what you make, its what you spend. I talk about making bank from teaching ESL not because you’re getting paid hundreds of thousands of dollars – far from it. But because you are paid decently, there’s tons of bonuses, minimal expenses and these countries generally have lower costs of living. Your monthly salary is generally between $2,400-$3,500 depending on country, hours worked and experience. That’s not really that much money in the grand scheme of things. But the reality is, you should have no problem saving 50% of that per month on a minimum if you’re even the disciplined in the slightest. Next, the bonuses. I mentioned earlier how your flights to and from the country are covered by the company sponsoring you. You are also paid a severance package of a month’s salary after finishing a year, and you pay into a pension each month which your hiring school matches. That pension generally equals out to more than a month’s salary. Next, expenses and costs of living. Low. Your hiring school also provides either an apartment or a monthly allowance for living expenses. Goodbye rent. You are only on the hook for utilities, internet and then personal expenses. In Korea my monthly utilities never went over $60 all in. So, let’s say we are able to save $1,000 a month, plus have $5,000 in severance and pension payment at the end of the year.. $17,000 dollars saved. $17,000 easily saved, all to travel, see the world and teach your native language to little children every day.. 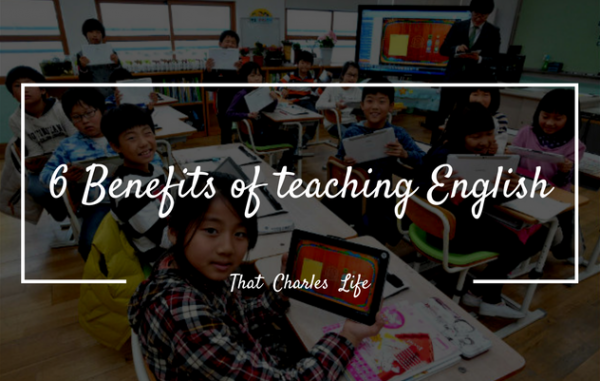 If you are interested in learning more about teaching English abroad or online, please contact me directly at info@thatcharleslife.com or find the contact page above. I love helping people get abroad to experience this wild opportunity. I work with some real helpful and passionate recruiters. As always, onwards & upwards! Recently, I’ve seen your article and read it carefully. You’ve explained very good. I really liked it. So, keep up the good work.